Bocas Del Toro, Panama holds the key to a beautiful vacation full of every kind of paddling condition you could dream of. This little chain of three islands is a still small enough to be untouched by big business hotel chains and the only road you will see is the dirt one from the airport to the water. From then on its travel by water taxi, stand up paddle board or your feet. Welcome to a tropical paradise where the jungle meets the sand and the only packing you will need is your flip flops and a swimsuit. Jungle Paddle to Underground Cave: Time to go down into the jungle floor and explore the inside of this beautiful place! 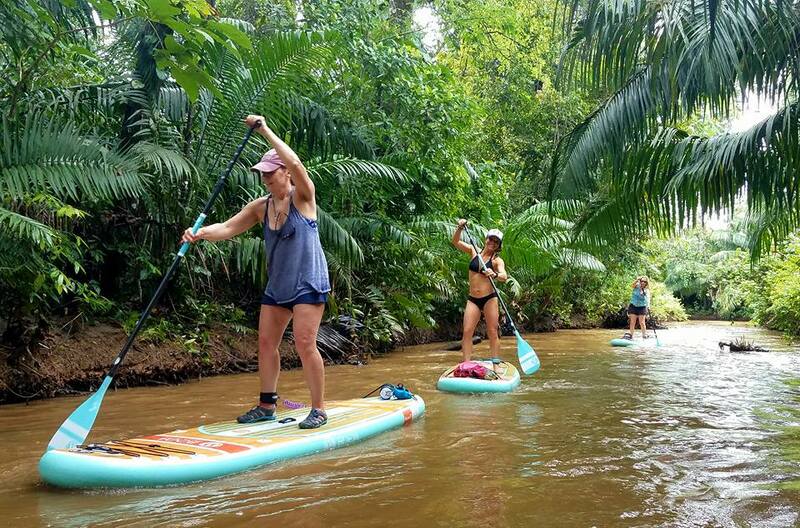 We stand up paddle through a winding mangrove river where we end up at a local tribal village. Our local guides will then take us down into the caves to explore a whole new world. Refreshing ground water flows through these caves and we will be climbing over, under and through this maze. If you're lucky you may find ancient shark teeth in the sand that have been washed through the cave in a pre-historic time when the area was covered by the ocean. Mangrove Paddle to Zip Lining: Being on a stretch of three islands offers a large variety of paddle options and this day we go on the back side of Isla Bastimentos where the water is as calm as a pool. The crystal-clear emerald water is the perfect temperature for a resting dip. Bring your snorkel and your cameras. The little bat rays below that swim in the area love to make friends. Once we arrive on Bastimentos we will head into the jungle for a thrilling Zip Line experience! For those who prefer a more relaxed day, you can trek through the jungle to relax on beautiful Red Frog Beach. Take your board with you if you'd like to explore another coast! Private Boat Tour To Starfish Beach - Likely a highlight of your trip. Our personal boat taxi will pick us up right in front of the house. This full day boating adventure will take you to one of the most beautiful beaches you have ever seen. Relaxation, paddling and playful silliness are all on tap. You'll be swimming in pristine waters over beautiful starfish, enjoying local Caribbean meals and sipping on fresh coconuts during this day of bliss and fun. Coastal Bike Ride. The shores of Bocas Del Toro are stunning and you'll spend one day on a beach cruiser soaking up the sights. We head out from Bocas Town down the coast where the photo ops are endless. 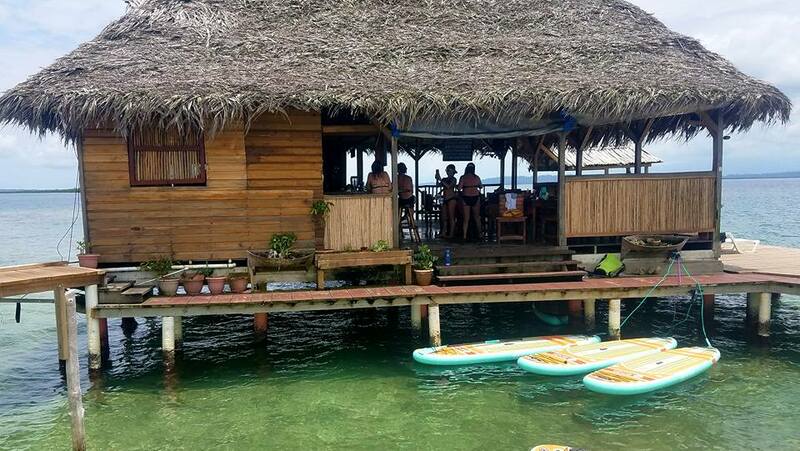 Along the way we stop at an island style lounge for some of the most peaceful moments you'll ever experience. No hammocks here...only VIP style cabana beds and sun loungers. Naps and dreams are highly recommended. $500 deposit payable directly online. Balance can be made in payments at your leisure. Final payment due August 12th. Balance payment instructions will be emailed to you upon booking your deposit. All payments and booking handled through FLOW World Travel. This link will take you to our partner companies’ website for booking, Flow World Travel. For questions regarding this trip it is best to contact Flow World Travel directly. As with all our trips, paddle excursions are accessible for any level of paddler. Panama does offer a diverse selection of conditions so the more advanced paddler may take a more challenging route while the beginner will be able to stay with in an area that is comfortable for them. It's all there in Panama! If you like to surf….pray for a swell and we’ll be catching morning waves right in front of our house! Set just inside the palm tree canopy and feet from the waters edge, our luxury accommodations are the prime location for maximum adventure and exploration. Our deluxe island home features 6 private suites each with their own king bed, private bathroom and air conditioning. 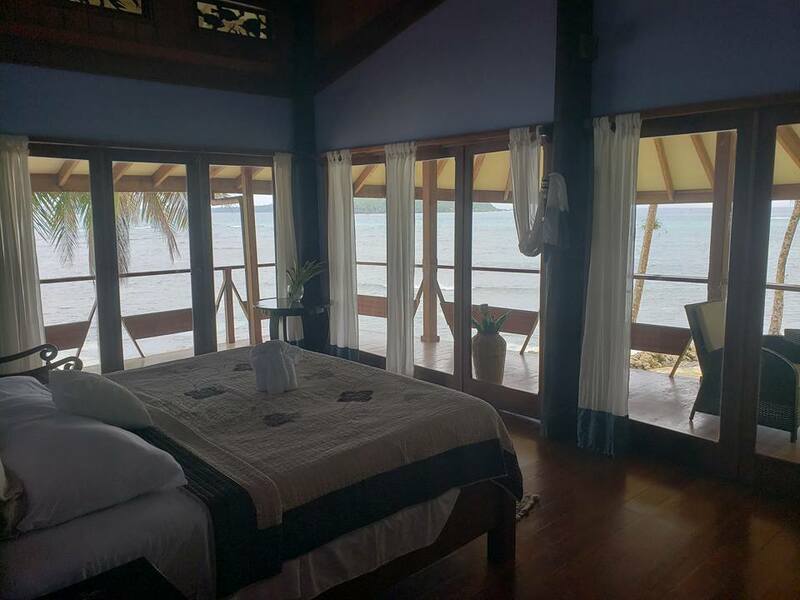 You go to sleep with the sound of waves crashing and wake up to the sounds of tropical birds chirping. The pictures below show you all you need to know. This is adventure travel in style! Bocas del Toro has long been a secret world class surfing destination that has managed to stay off the radar of the masses. Its largest developed area is comprised of a main street with a handful of small hotels, restaurants and bars. Off that strip it's all nature, coral reef, jungle, lagoons and surf. For our trip we go one step further into nature and take a short 5-minute boat ride to Isla Carenero where there are zero roads. The only way we get around there is via trail, boat and stand up paddle boards! Set on the most beautiful point of the island lies our private estate home and our private beach! 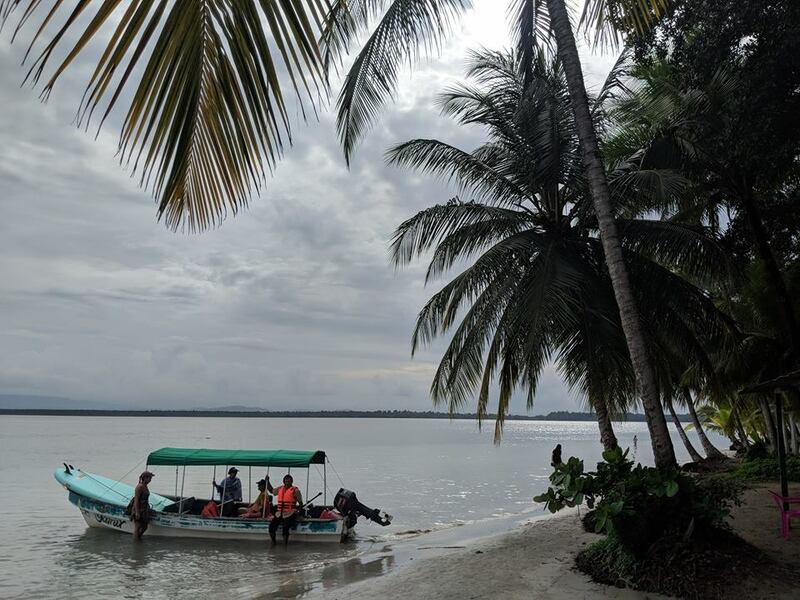 Two flights are needed to get to Bocas Del Toro. One to Panama City and one from Panama City to Bocas. Your Bocas flight is included in the price of your trip ($220 value). You will purchase the flight to Panama City on your own. Of course, we want to make your vacation as effortless as possible so you can just book, pack and enjoy! If you have miles to purchase your flight then great! Otherwise we can handle all of the booking for you. Simply select the "With Flight" option when booking. We will contact you to arrange everything. Expected flight costs are roughly $550 out of most major airports. Our years of experience have found it best to leave dining options open to our guests instead of including it in the price of the trip. This allows you to eat what you like and allows us to provide you more experiences at less of a cost. Food is pretty cheap in Bocas. You can easily eat like a king on a shoestring budget. Because we have an amazing house with an awesome kitchen you can cook whatever breakfast you prefer to keep you fueled each day. There is a small local store on the island to stock up on supplies. During the day you are almost always out on an excursion and we know all the great restaurant destinations to grab some Caribbean deliciousness. Our Carenero island home has 3 great restaurants the group tends to frequent for dinner. Of course,you can always jump on a boat taxi and experience "driving" to dinner at the main island of Bocas Town. Meal cost in between $5 and $12 on average for lunch or dinner.